NeuroTrauma Sciences, LLC (NTS), a biopharmaceutical company, and Henry Ford Health System, a non-profit organization, today announce that a newly-formed subsidiary of NTS has entered into multi-year Sponsored Research and License Agreements. The new company is named NeurExo Sciences, LLC (NXS) and its goal is to advance Henry Ford's pioneering technology involving exosomes as extracellular vesicles enriched with microRNA for the purpose of treating stroke, traumatic brain injury (TBI) including concussion, and neuropathies. Under the Agreements, NXS will license methods and intellectual property (IP) from Henry Ford and fund exosome research projects headed by principal investigator Michael Chopp, Ph.D., Vice Chairman, Department of Neurology, Scientific Director, Neurosciences Institute, at Henry Ford Hospital. NXS will gain worldwide commercial rights to product candidates resulting from the IP and sponsored research coming out of the lab. Dr. Chopp and his research team have generated proof-of-principle data in a number of small and large animal models showing how exosomes can amplify the body's own neurological repair mechanisms and potentially improve long-term neurological outcomes following brain injury, such as stroke or TBI, and neurodegenerative diseases (link to Dr. Chopp's research here). "Our studies in multiple pre-clinical models indicate that exosomes have the potential to provide significant therapeutic benefits to enhance the recovery from stroke or traumatic brain injury, and potentially with a better safety profile and greater efficacy than their parent or progenitor cells," said Dr. Chopp. "Success of this novel approach may lead to a shift in the treatment paradigm for TBI, stroke and neurological disease." "We are delighted to collaborate with Dr. Chopp and his research team to advance the next generation of cell-based therapies," said Carl Long, NeuroTrauma Sciences and NeurExo Sciences Co-founder and Chief Executive Officer. "We believe that exosome technology has the potential to serve as a transformational platform for multiple neurological conditions – including stroke, concussion and other traumatic brain injuries – and NeuroTrauma Sciences is excited to be a part of it." "Henry Ford researchers are pioneers in the exosome field and the NeuroTrauma Sciences team recognized the tremendous potential of our technology and world leading scientists," said Mark Coticchia, Vice President & Chief Innovation Officer of Henry Ford Health System. "We appreciate their support in pursuing the development of this cutting-edge technology with these Agreements, and their commitment to investing in the broader Detroit scientific community with the formation of this new company." Exosomes are small extracellular vesicles that transport regulatory genes and proteins between cells, allowing organs, tissues and cells to communicate with one another, causing biological responses. 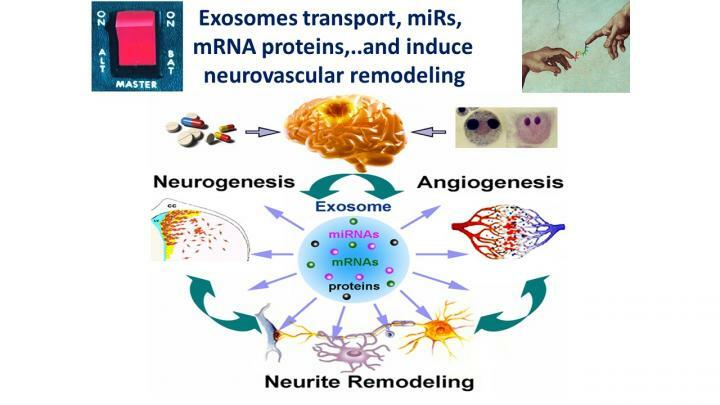 As cargo, exosomes contain microRNAs that regulate gene translation and play primary roles in mediating a vast array of biological functions, including the potential to concurrently enable multiple pathways of neurorestoration. Henry Ford Health System is a six-hospital system headquartered in Detroit, Michigan. It is one of the nation's leading comprehensive, integrated health systems, recognized for clinical excellence and innovation. Henry Ford Health System provides both health insurance and health care delivery, including acute, specialty, primary and preventive care services backed by excellence in research and education. Henry Ford Health System is led by President & CEO Wright Lassiter III. Visit HenryFord.com to learn more. Established in 2011, Henry Ford Innovations engineers the future of healthcare through identifying and commercializing the health system's technologies and know-how. Its main arms include Research and Education, Technology Management, Corporate Innovation, and International Programs. To learn more, visit HenryFord.com/About/Innovations. Dr. Chopp is dedicated to translational research in neuroscience, and he and his group are recognized as foremost authorities on exosomes and microRNA for treatment of neurological injury and disease. The focus of the laboratory is the pathophysiology of stroke and traumatic brain injury; mechanisms of neuroprotection, cell-based and pharmacological neurorestorative therapies for stroke, traumatic brain injury, and neurodegenerative disease. Dr. Chopp has approximately 750 peer reviewed publications and has received numerous prestigious research awards. His laboratory, comprising 53 researchers and staff, is one of the leading research centers in the world in translational neuroscience and restorative neurology and was the first lab to use mesenchymal stem cells (MSCs) as well as exosomes derived from MSCs and other sources, to treat stroke, TBI, and neurodegenerative diseases. His lab has been awarded more than $80 million in total funding and has 13 active NIH grants. NeuroTrauma Sciences (NTS), a private biopharmaceutical company, is focused on developing novel therapies to treat the complications of brain injuries due to stroke, traumatic brain injury and concussion, and other neurological conditions. NeuroTrauma Sciences is building a portfolio of innovative product candidates focused on neuroprotection and neurorestoration ranging from early research stage through early clinical development. NTS was founded in 2016. For additional information, please visit http://www.neurotraumasciences.com.